The NEOMED Alumni Association presents Six Night in Rome, a guided tour of the Eternal City departing October 10 and returning October 16, 2019. You can check out the full itinerary and register via Collette. 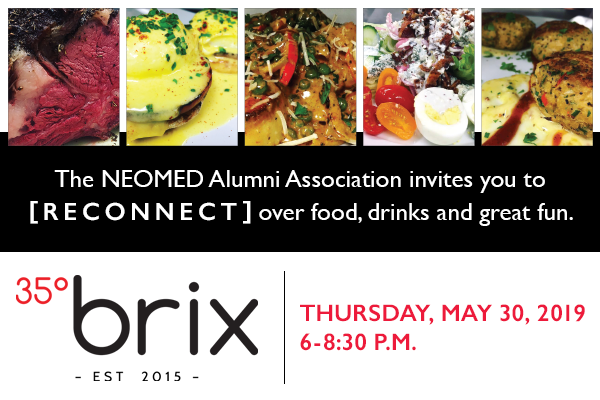 Reconnect with fellow alumni, the NEOMED alumni association and College of Medicine leadership in the Akron/Canton area on May 30 at 35 Degree Brix in Green, Ohio. The May 2019 Alumni Association Board Meeting is open to all alumni. Continental breakfast begins at 9 a.m. and the meeting begins at 9:30 a.m. Meeting will adjourn by noon. The NEOMED Alumni Association is excited to introduce Six Nights in Rome, a Collette guided tour of the Eternal City. This NEOMED alumni-exclusive travel opportunity is scheduled for October 2019. Join us for a complimentary travel presentation and Q&A. Join us for our Fall lunch meeting! We will discuss and start planning our upcoming events. Lunch will be provided.